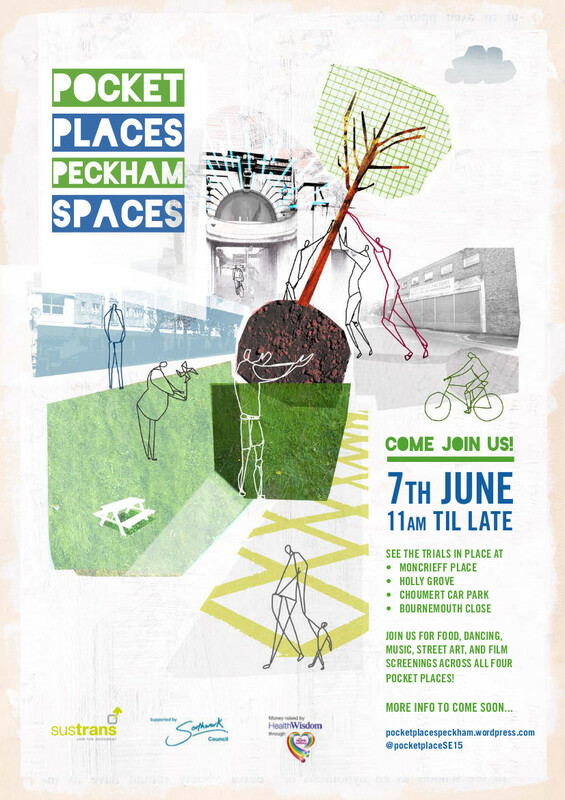 Pocket Places Peckham Spaces! Join us for lots of fun on Saturday 7th June across four Pocket Places along Rye Lane! There’ll be world class street artists in action and they’ll be running workshops too; beautiful food and drinks from local businesses; there’ll be live music bringing the bandstand to life; a bring and fix event helping you to mend treasured posessions; yoga and capoeria classes; a market and much more, all finished off with a film screening on the site of the old Tower Cinema. Along with all that entertainment this will be the first opportunity to see all of the Pocket Places trials in place at the same time, we welcome your feedback on them and they will stay in situ for up to 6 months following the event. You will be able to comment on them throughout that time. Your views and comments will help us to decide which of the trials should become permanent, so make your voice heard. We can’t wait for the festivities to begin, and we look forward to seeing you there! I see your plans for choumert car park. We already have street markets on rye lane. How about a flower market. East London have a successful flower market named “Columbia road flower market” whereby artists congregrate and sell garden sculpture, and there are plenty of cafe’s to have lunch that have sprung up over the years. This way we do not take business away from the current peckham traders (high street) whom like most businesses are finding trading in the austere times difficult. The second proposal for an outdoor artist performance area is a attractive one, but may not work here because you have flats occupied up above this vicinity, besides this is already occuring across the road in the Bussey Building/ Frank’s Cafe you could be in danger of duplication of ideas here? As for the mural drawing on the walls perhaps you could find out more about this site from Southwark Council then translate that history into a mural on the walls. Well done in your efforts to gets things done in Peckham it is much appreciated and pleasant to see the different projects occuring in pockets of Peckham Area. Read contributing Artist, Helen Peacock’s story here and join her and all everyone else involved with this fantastic project on the &th of june. No more murals…please… If I want to see art I can choose what I like and go and see it, not have it inflicted on me. (Actually I would like a vegetable market more along the lines of fresh airflown italian organic would be lovely). Piss off back to hackney! Hey what is happening with this artwork planned for the entrance carpark wall – of last year June. It is peeling of the wall, is this going to be permanent – is this the planned mural- surely not? Hi Alison, apologies for the delayed reply! We are working with Peckham Platform and the Culture and Arts Department at Southwark Council to commission an artwork for the space. This is due for completion this summer. When there is more to share I will post a blog on this site. Thanks, Hannah. Perhaps the flower traders of East street Market could trade here once a month. The prices for their flowers and small potted trees are good value for money and most importantly the stall holders are courteous.They understand the local consumers of Peckham, Walworth and Camberwell should not be exploited by inflated pretentious prices – which is what usually happens when the newbies are lured into the area by the news of area regeneration improvements. Hi Alison, this is a suggestion for the Markets department at Southwark Council. http://www.southwark.gov.uk/info/10005/markets they manage all the market places in Southwark and could make a decision on that for you.